I jump at the chance of working on any cover for a Beverly Stowe McClure book. I just love her writing. We've worked on two other books together, as well; Just Breeze and Life on Hold. Ten-year-old Kate Taylor dreams of being the star of her basketball team, Angels. When Kate’s tooth is knocked out at one of the games, and her mother, who is also her coach, says she can’t play until the tooth the dentist replants heals, Kate’s dreams are in jeopardy. Add Emily, the new girl at school who claims she’s the best, and Kate faces a challenge to prove that she is the star. 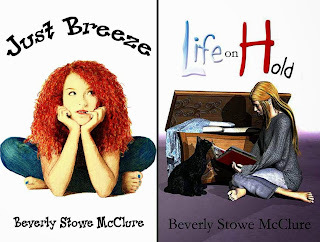 Beverly Stowe McClure is the author of picture books, early readers, middle grade and teen novels. She is a member of the Society of Children’s Book Writers and Illustrators, both national and North Texas. A fourth generation Texan, she lives in the country with her husband, two cats, and a variety of wild critters.